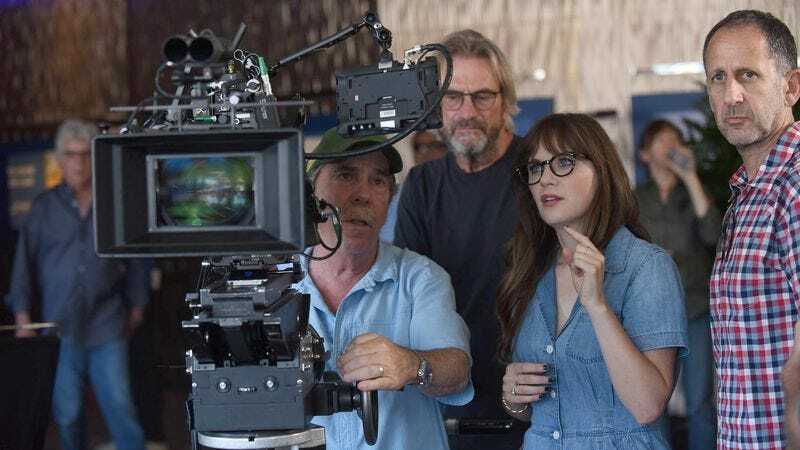 Zooey Deschanel on the set of New Girl's season-six premiere, "House Hunt"
Zooey Deschanel made a name for herself with a stream of offbeat-yet-endearing performances in films like All The Real Girls, (500) Days Of Summer, and Elf. After launching a recording career as one half of She & Him, the performer found her defining role as Jessica Day on Fox’s New Girl. Originally positioned as a showpiece for its “adorkable” star, the show has evolved into one of TV’s most impressive ensemble comedies. New Girl begins its sixth season tonight, with an episode that finds Deschanel following in co-star Jake Johnson’s footsteps by trying her hand at directing for the first time. She recently took some time to speak with The A.V. Club about life both in front of and behind the camera. The A.V. Club: Some viewers might not be aware that there are some improvisational elements to New Girl. How does that work on set? Zooey Deschanel: I would say generally we’re kind of loose on set. Some sets are real word-perfect; our set thrives on its looseness. Most of the actors are really good improvisers. Some scenes we stick to on-book, especially if it’s a more dramatic scene, or if it’s perfect as is, or it just works best sometimes. And then a lot of times we’ll just open it up and play a little bit. AVC: Was that hard for you to take on? Was your acting career in movies not as loose as that? ZD: No, I actually did a lot of improvised movies or movies that were partially improvised. All The Real Girls was a lot of improvisation. We did rehearsals where we’d also improvise for long periods of time and then write everything down and kind of rework the script around the actors. Most comedies tend to be—unless they’re really old-school. They work better when they’re loose anyway. So I was used to being loose on set with language, and I don’t thrive in a word-perfect environment. AVC: How was that for you stepping behind the camera for the season opener? When you’re improvising, your actors are improvising, and you’re in the scene—do you do a number of takes? If you have one that’s good, do you then try another one and see where it goes? How did that work for you? ZD: Yeah, it was a great experience. We’re in our sixth season, so we’ve all been working together a long time. It’s very much a collaborative effort at this point. There are no dictators on set. So it was really fun to be able to take a kind of behind-the-scenes angle on it, and I really enjoyed myself. It was especially fun to help the guest actors coming in create the characters and figure out how to play those characters. Because all the actors are great to work with, but they all know their characters really well, so it’s not a huge amount of adjustment you’re doing. It’s kind of a small range of adjustments. AVC: Over the course of your last five seasons, the premiere episodes really set up the rest of the season, like the one with all the wedding invitations and that leads to various relationship entanglements. So this one is really setting up everyone’s new pathways in season six, right? ZD: Yeah. You know, it’s interesting because this premiere in particular is not as big a production as some of the other premieres. It’s more about just setting up the emotional tone of the season. Schmidt and Cece are moving on, and they really want to grow up and have their own house as a couple. And then Jess has admitted to herself that she has feelings for Nick and she has to get over those feelings to be friends with Nick, because he is in a serious relationship. So I’d say this episode is really setting the emotional tone for the season. AVC: Do you think directing is something you would want to take on again? ZD: I loved it. It was a lot of work. The thing that I thought was most difficult was—it was really fun when I wasn’t in the scenes. And when you’re in the scenes it’s a little more stressful because you’re trying to act and give a good performance and then judge yourself as well as direct and judge other people. We have stand-ins for blocking, so I could have my stand-in do my action so I could see what that looked like. AVC: What have been some of your favorite episodes of the show overall? ZD: It’s hard because there are a lot I love. There are a lot of good ones in the last two seasons, but the ones that always stick in my mind are always the first few seasons because it was so new, and I had seen fewer episodes at that point. Like at this point there are 120 or something. I always think of, first or second season, there’s this episode, I think it’s called “Menzies,” I love that. There’s an episode called “Bad In Bed” that I loved. There was an episode in the first season called “Injured” that I really loved. And now I’m blanking because there are so many episodes. AVC: Think of all the shows that have come and gone since then, why do you think New Girl has outlasted a lot of similar TV comedies? ZD: You know I can’t say 100 percent for sure, but I think that the cast has really good chemistry. At the end of the day everybody works really well together. And we have really great writers. And I think that the story is relatable enough that a lot of people can find themselves in it, but it also has a lot of weirdness that makes it unique.